Name as many famous spiders as you can – GO. Let’s see, there’s Charlotte, Aragog, the “her” from LOTR, the ones John Goodman had to fight in Arachnophobia, the one that freaked out Little Miss Muffet…What other spiders did you come up with? How about this one – Spider Energy. 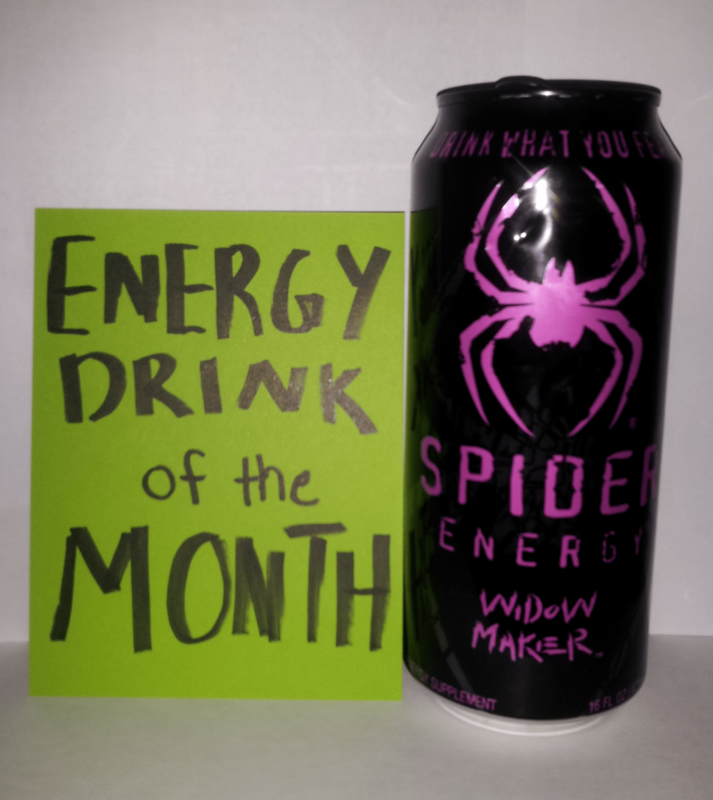 With a head nod towards Halloween, this month’s pick is Spider Energy. Other flavors are available but I prefer Widow Maker for its flavor, its tagline atop the can, and its colors scheme. Anyone can review a beverage and tell you how they like the flavor, or how the ingredients affect them. I find these reviews helpful and steer you toward those reviews when I can. However, ultimately my goal is to give you the tools so you can go beyond someone else’s review and determine, just by looking at a can, how the product might affect your own body in your particular condition of fatigue. Give a man a fish, feed him for a day; teach a man to fish, feed him for a lifetime. This product has 240 milligrams of caffeine per 16 ounce can, and this information is kindly included on the Nutrition Facts Panel. Keep in mind those under 18 should have less than 100 milligrams of caffeine per day, according to the American Academy of Pediatrics, and those 18 and up should keep daily intakes below 400 milligrams, the maximum dosage considered safe by Health Canada and the US FDA. All of this assumes you aren’t pregnant or nursing or have a pre-existing condition that makes you sensitive to caffeine. 2 – Servings per Container. At one point, Spider Energy was two servings per can (see the picture from my collection, below). 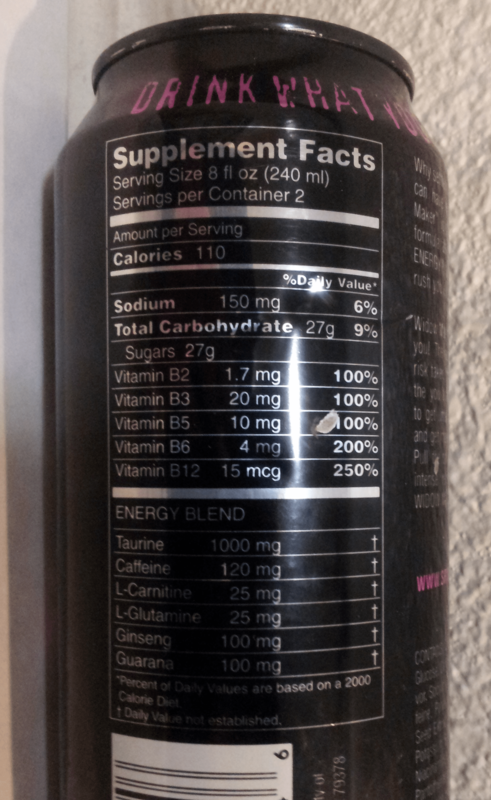 Nowadays, Spider Energy labels indicate one 16 ounce can is one serving, but always confirm the number of servings per container before making any judgments on any other nutrients. We’ve all seen the super-sized muffins that are supposed to be three servings, right? If you consume one whole 16 ounce can, you’re getting 240 milligrams of caffeine, which is not a small dose, but nothing obscene or potentially hazardous like some of the other energy products out there. Remember that you are not legally or morally obligated to drink the entire can in one sitting – the label is not the boss of you. This product is not weak so there will be days when half the can will do. Remember the words of Paracelsus: the difference between medicine and a cure is the dosage (this is also a song by Circa Survive). 3 – Carbonation and/or Juice. Carbonation slightly irritates the stomach lining, speeding up caffeine absorption. Energy drinks with fruit juice are usually non-carbonated or lightly carbonated so those products might be better suited for those seeking a milder pick-me-up. When you want to take advantage of this nifty trick, check the ingredient list: in this case carbonated water is the very first ingredient, so there’s your answer. Note this can from my collection says 2 Servings per Container and uses a Supplement Facts panel – this product has been reclassified as a beverage so current products feature a Nutrition Facts Panel, and the label has been updated to say 1 Serving per Container. Note all the Green-Eyed Insight here applies to both the previous and the current product. Vitamins help your body perform reactions that can generate energy, but vitamins are not the source of energy. This is why you should be cautious of products that promise to deliver heaps of energy in the form of vitamin mega-doses. Even some water-soluble vitamins like niacin (vitamin B3) or vitamin B6 can lead to side-effects when you consume too much, so it’s always good to double-check the label for those particular vitamins. B6 – Side-effects for B6 start at 100 milligrams so even if you did chug the whole Spider Energy, you’re only getting 8 milligrams (twice the Daily Value) of vitamin B6. Niacin Flush – For this particular product, the amount of niacin per SERVING is 100% Daily Value, which is 20 milligrams. At 35 milligrams, some people experience a “niacin flush” – mild itching and flushing of the skin. Drinking the whole can provides 40 milligrams of niacin, enough to cause the niacin flush in some people. But, if you’re smart and if you’ve been listening to my advice all this time, you know better than to chug the whole can in one sitting. Better yet, perhaps you’ve met Mr. Swift and Mr. Thrift in Are You a Monster or a Rock Star: a guide to energy drinks, so you know how manipulating the speed of consumption can alter the ways caffeine affects your body, giving you, literally, more bang for your buck. In one 16 ounce can, there are a whopping 30 grams of sugar. For those of us limiting added sugars, there are sugar-free versions of Spider Energy. Then there are some people who might actually benefit from the sugar – people working a swing-shift with no time to eat, bartenders working the Vampire Schedule with no lulls to get real food…you know who you are. In this product, the sugar comes from sucrose (literally, table sugar) and glucose. Skimming the ingredient list all the way through shows no HFCS (if you care about that and if you’ve forgotten that regular sugar can be just as bad in excess as HFCS). Moreover, this product is sweetened with Sucralose (Splenda), and Ace-K but not aspartame (good news for those with PKU). Again, it all comes down to making the best decision for you – your body, your situation, your call. For a complete breakdown of these levels and how to use them to maximize caffeine’s effects while minimizing your intake, check this out: 5 Levels of Fatigue.